September 27, 2012 - Members of Congress were in Ontario, California on Thursday to conduct a hearing examining the economic impacts and future plans for the LA/Ontario International Airport. The hearing focused in part on the continuing developments regarding the future management of the airport, and received testimony from local and regional government officials, business associations, and other stakeholders. “I appreciate City of Ontario Mayor Leon, Congressmen Baca and Calvert, the airport board members, the city and county officials, and the concerned citizens who attended today’s hearing,” said Subcommittee Chairman Petri. “I particularly want to thank Congressman Gary Miller, a senior Member of the Transportation and Infrastructure Committee, for his interest in this issue and work in bringing about this Congressional hearing,” Petri continued. “I want to emphasize that the presence of the House Aviation Subcommittee here today should not be interpreted as a sign that Congress plans to interject itself into future decisions related to the management of the airport. This is a matter that must be decided by local and regional policymakers, many of whom are in attendance here this morning,” Petri said. “I would like to thank Chairman Petri and the Aviation Subcommittee for holding today’s hearing,” said U.S. Rep. Gary Miller, a Transportation and Infrastructure Committee Member. The Aviation Subcommittee is one of that panel’s six subcommittees. “Ontario Airport is a significant economic and transportation asset for the Inland Empire. LA/Ontario International formerly Ontario International Airport, is a public airport located 2 NM east of the central business district (CBD) of Ontario, a city in San Bernardino County, California, USA. 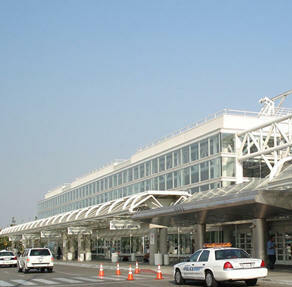 This airport is owned and operated by the Los Angeles World Airports (LAWA), an agency of the city of Los Angeles.